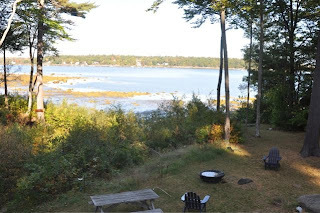 Woke up this morning on Casco Bay, Maine. 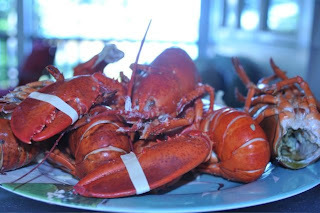 At an uber affordable $5 per pound for 1-1/2 pound M-A-I-N-E L-O-B-S-T-E-R-S, we order 14 lobsters for 6 lobster eaters at last nights lobster fest. 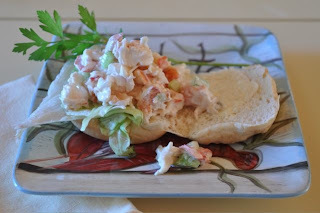 With quite a few left over, I got cracking early and made the fixins' for delicious, low-mayo lobster rolls. It was cold enough outside (mid 30's) that the left over cooked lobsters spent the night on the screened porch. Cleaning six lobsters is quite a bit of work. The most important part is draining out any liquid and removing the green tamale and red roe by rinsing the lobster under running water. Before assembly the salad for the lobster roll, gently squeeze out any watery liquid before adding the dressing. In a mixing bowl, mix together the mayonnaise, lemon and Tabasco Sauce with a fork, add celery and lobster and toss until well-mixed. 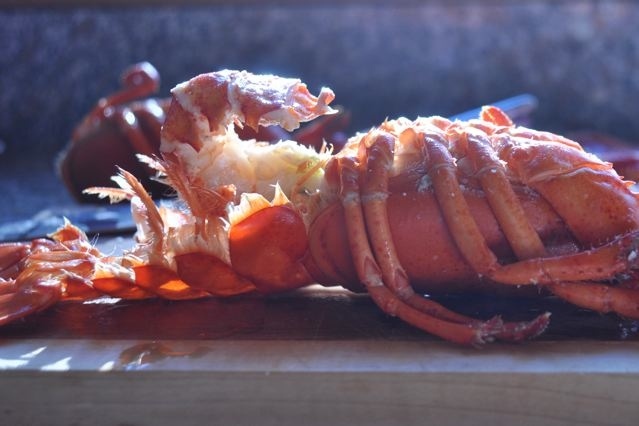 Butter four hamburger buns, place a lettuce leaf on the bun and spoon one-fourth of the lobster on each one. Top with parsley or basil. Fishing is a way of life on Chebeague Island, Maine which is one of the larger islands in Casco Bay. Amos Doughty, whose family are original Chebeague (pronounced SHA-beeg) settlers, lives on Deer Point which is on the western side of the island. Amos is a quintessential lobsterman (and conservationist). Yesterday, he hauled out 14 beautiful one and half pounders from the traps in the bay behind his house and delivered them to our house at 4:00 just a few hours before dinner. Amos sat with us for a spell and had a glass of ice cold lemonade. Full of stories (and some good gossip), Amos shared the big morning news... a moose was swimming along the coast at Deer Point. Moose photo here.